On the morning of day 12, I discovered our holiday park had a trampoline. This is the spa pool where we had a soak the night before. And these are some ducks. Good morning ducks. We left the holiday park just after seven and drove along this road for a while until I realized it probably wasn’t the road to Christchurch. 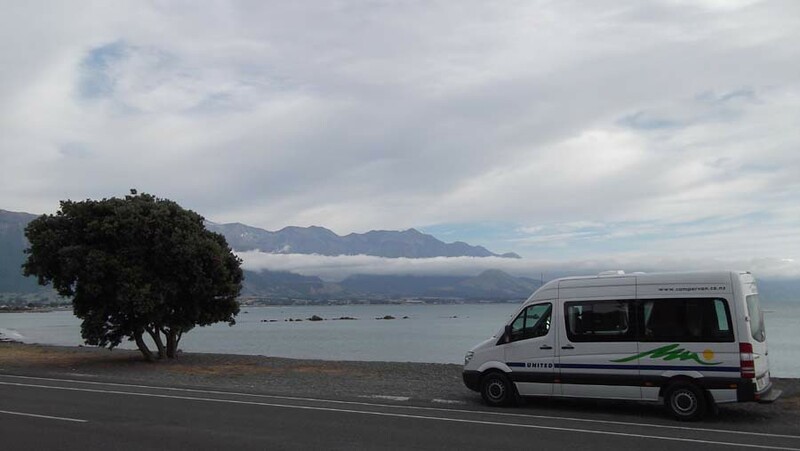 Kaikoura’s a popular place for tourists and I asked one of the owners of the holiday park what there was to do here. Lots of fantastic tours, I mean there’s beautiful walks. We’re very lucky, we’ve got the mountains right here as well of the coastline. Fairly spectacular coastline with the seal colonies dotted along as you’re coming into Kaikoura. Swimming with dolphins … amazing experience, I did that a coule of weeks ago and it was just incredible, it was great. Swimming with seals as well and of course the whales. The whales are here all year round. We’re very lucky with that. There’s a resident pod out there. A whale watching tour is definitely on the list for next time. This is the road to Christchurch. On the way to Christchurch we saw a camp site called Paia Point. It looked like a really nice place to stay, apart from the unnecessary apostrophe. Another place on the list for next time. Before we went into the city, we checked into the place we were staying that night which was in a town calledSpencerville, about 20 minutes from the centre of Christchurch. Spencer Beach Holiday Park is a huge place next to the beach. We stayed on site number 28. We had a quick look at Spencer Beach. It looked really nice, but it was too cold to go swimming. Then we headed to the United Campervans Christchurch depot to swap motorhomes, so we could try out a slightly different one. United’s Christchurch depot is near the Christchurch Airport, in a suburb called Burnside. We filled the tank up at a service station near the depot. 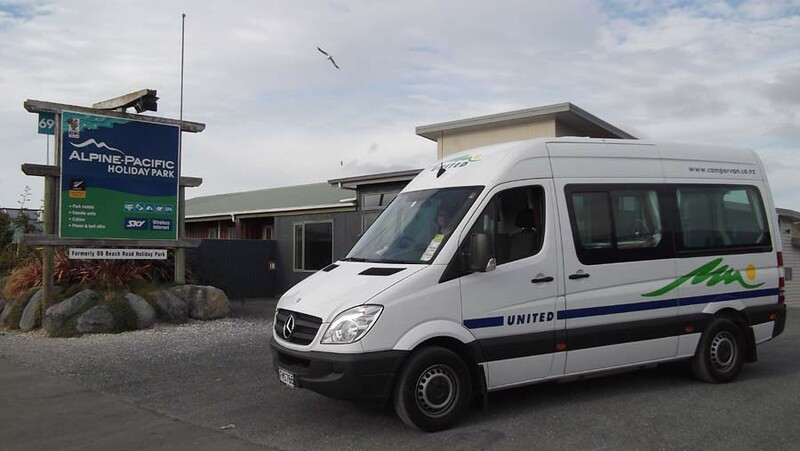 And this is the United Campervans Christchurch depot. United also has a brand called Alpha. Those are the slightly older vehicles. The United motorhomes are all less than three years old. Our new motorhome was slightly longer, it had an extra seat which folded down into a bed and it had a DVD player. 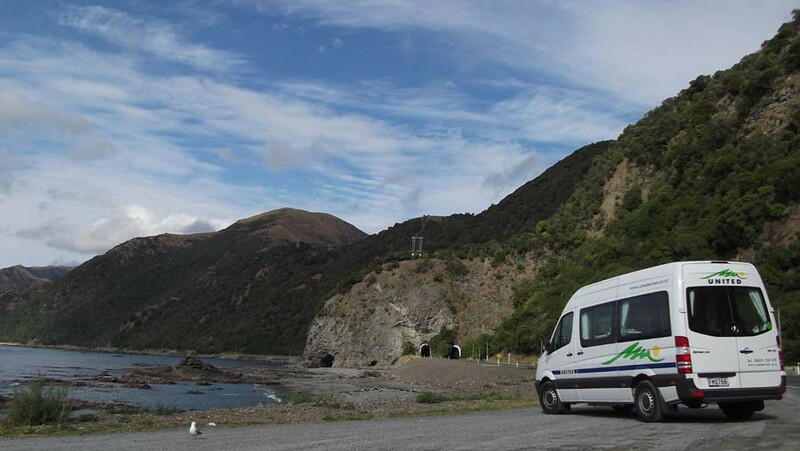 I talked to Aaron at the depot and I asked if he had any advice for people travelling around New Zealand by motorhome. Don’t plan too much ahead. People arrive here and they’ve got 7 or 10 days or something and they’ve got something they want to do every day. But you don’t know what you going to see and where you want to stop. And that’s the best way is just to get in and if you find somewhere you want to stop then stay there for a bit. But if you plan it too much then you normally find that you’ve missed out on things you wanted to see at the end. So, take it easy and relax. It’s a holiday, not a race around the country. We moved all our stuff to our new Sprinter, signed a few pieces of paper and then we drove into the middle of Christchurch to check out the city. 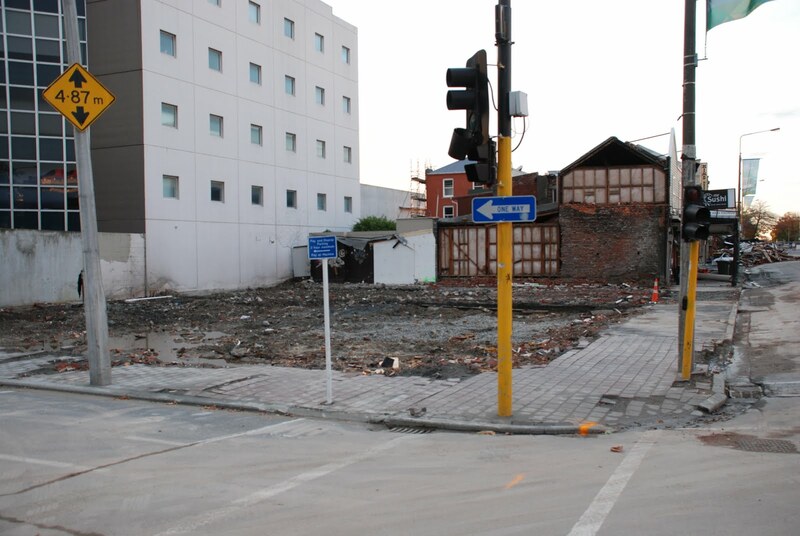 I lived in Christchurch when I was studying here in 1999. This is my old flat. This was my room. 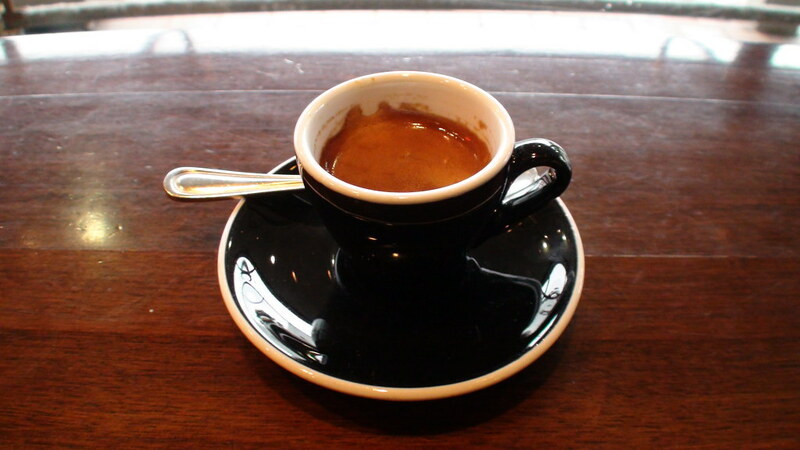 I bought a postcard from a shop in Colombo Street and we had a coffee at the cafe opposite my old flat. We used to come here quite a bit for coffee. I remember my flatmates liked one particular staff member as much as the coffee. We sent the postcard to the US and had dinner at the restaurant under my old flat. Then we went for a bit of a drive around the city. It was quite hard to get around because a lot of the streets were closed after the earthquake on the 4th of September. It was really depressing seeing all the damaged buildings and all the graffiti. I thought it looked kind of like a giant had come and shaken up a toy city and then scribbled all over it. It wasn’t all sad though, we saw people out in the city who seemed to be having a good time, eating and drinking. Hello! I worked in bar called Sababa when I lived here. It was a great place. I really enjoyed working there. This is where it used to be. I wanted to go and check out a new bar that I’d heard someone talking about on a radio show that I listen to so we went on a mission to find that. On the way I saw a few dogs. And this awesome video store that I used to go to. We found the bar we were looking for, Goodbye Blue Monday. It turned out to be a very cool place with tasty beer, comfy couches and a ping pong table. I asked the bartender about the name. 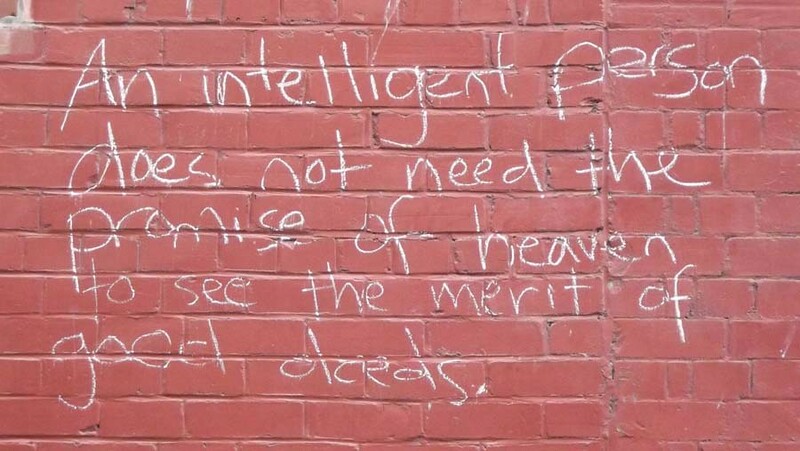 It’s from a book by Kurt Vonnegut called Breakfast of Champions. And it’s the slogan of … it means all sorts of things in the book, basically we’re just obsessed with Kurt Vonnegut. But it’s the slogan of a company in the 1930s and 40s that makes automatic washing machines. And it’s … so they’re saying that traditionally women had to do the washing on Mondays, so Monday was the most horrible day of the week for them, cause they had to do it all by hand. And by bringing electronics and technology into it it was like, “Goodbye blue Monday” cause they had a whole … I don’t know, that’s got no relevance to the bar, but it’s just, yeah, Kurt Vonnegut is awesome. 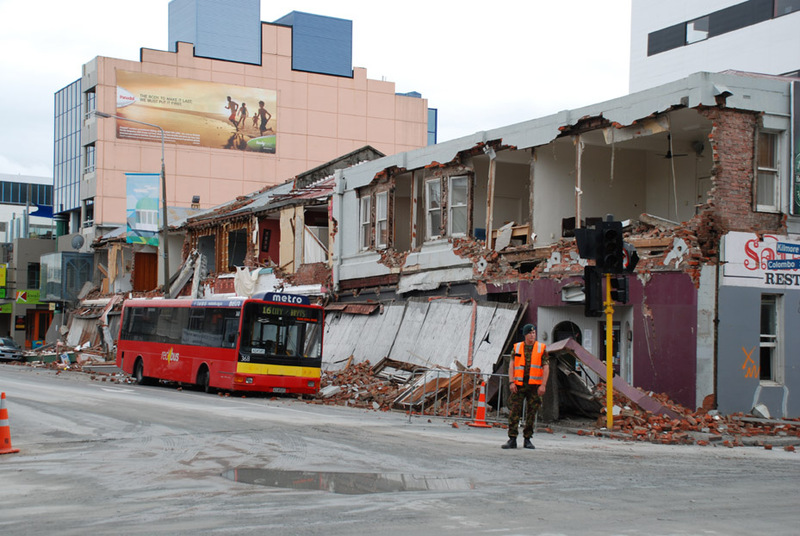 Seeing the damage in Christchurch was so sad. And then of course, as you know, a month later on the 22nd of February it all got so much worse. Goodbye Blue Monday has now closed. The building where we had coffee no longer exists. 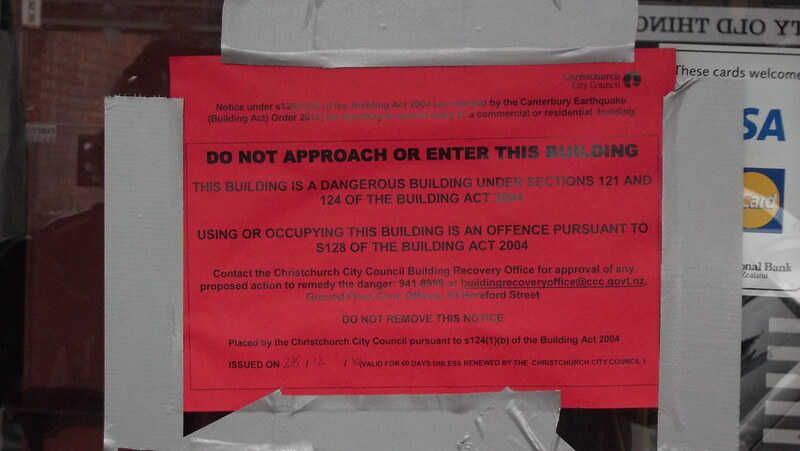 And from the pictures I saw of my old flat, I think that building’s probably been demolished as well. Motorhome we used from days 1 to 12.